It’s not often that a fortress is also a park, but that’s how Belgrade views the fortress. It’s always open. You can stroll in anytime. The fort overlooks the confluence of the Danube and Sava rivers. Many times, and then a few more times, the fortress has been destroyed, razed to the ground, and then rebuilt. 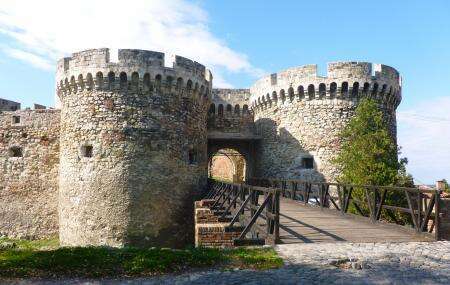 It’s the oldest part of Belgrade; in fact, for many years, when people said ‘Belgrade’, they meant only and all those things that were within the fortress. Today, there are two sections to the fortress – Upper and Lower Town. In the Upper town, you’ll find the fortress ramparts and gates, theMilitary Museum, the St. Petka Chapel the churches, the Roman Welland the Pobednik statue. The statue is a great place from where to catch a sunset. St. Petka’s chapel is a must visit – it’s a very pretty little medieval church, with enchanting, lavish frescoes on its walls. They say the waters of this church has healing powers. In the Lower Town, you’ll find the Daredevil Tower, the Turkish Baths and the Gate of Carl VI. The Kalemegdan Park is considered as an extension of the fortress itself. It’s very popular in it’s own right. It’s shady walks, convenient benches, sculptures and romantic couples strolling about make it one of the city’s favourite natural retreats on a hot day. How popular is The Belgrade Fortress? People normally club together Church Of The Holy Mother Of God and Belgrade Zoo while planning their visit to The Belgrade Fortress. Restaurant with great view, great food and great vine choice. It's good in summer with outside seating but also convenient for winter as there is huge space inside. Windows look at Sava and Danube confluence. Food: variety of different choices, with both international and local cuisine. Vine: just ask the waiter. Service: perfect! Perfect! Perfect! Ladies on wardrobe are super pleasant with efficiency in taking care of no matter what number of coats, assist in seating or taxi services. Waiters: friendly just enough, experienced, efficient and with excellent recommendations about the food and vine. The place is devided in 3 sections: upper, middle, and terrace - which I was told was closed, even though it was very sunny and almost no wind outside. Between 5 and 10 employees are hanging around in the upper section, nobody was to be seen in the other two - after 10 min. of being seated by the host, I got up and got the menu myself. Later, I was offered a salad I haven't ordered (shopska salata), next to me I hear a customer argue that she never got her salad, and to the waiter I told that I'm going to pay with card and some other waiter later comes to me and says he was told I wanted to pay with cash - poor communication- and service all over the place. The place looks like a high end restourant, but the service is way below that. The food wasn't bad though, which is why I give it 2 stars instead of 1.